I am a bit behind on VOSA but have started my look back at October. PH0004983/35 - FIRST DEVON & CORNWALL LTD, THE RIDE, CHELSON MEADOW, PLYMOUTH, PL9 7JT Variation Accepted by SN: Operating between TORPOINT FERRY and PLYMOUTH Bus Station given service number 81/81A effective from 02-Nov-2014. To amend Timetable. Changes are being made to services operated by First in Torpoint provide better bus connections for staff and patients using the towns new health centre which is due to open in the New Year. From Sunday 2 November, changes to Services 81/81A from Plymouth to Torpoint and Inswork will enable journeys to serve the health centre in Trevol Road. 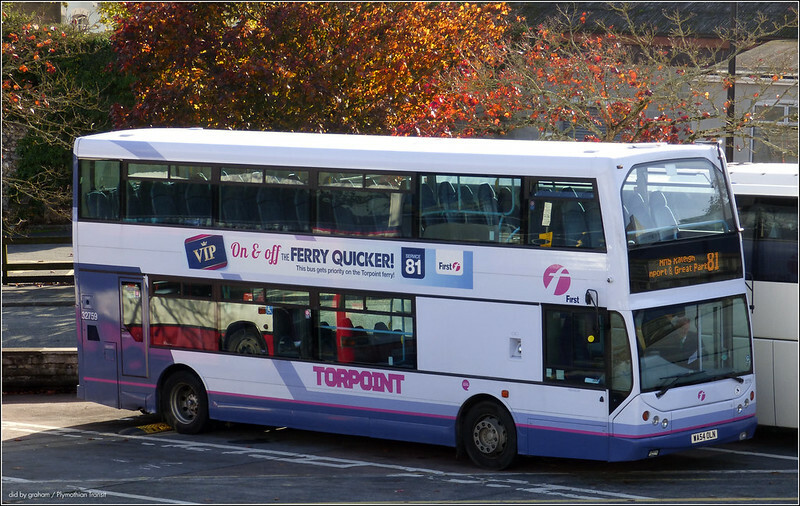 At the same time a new £1 fare (50p for those age 5-18 or NUS card holders of any age) will be introduced for all single trips on the 81/81A between the Torpoint Ferry Terminal (Torpoint side) and HMS Raleigh. Commenting on the changes, Paul Smith, First Devons Operations Manager said: "Feedback about these changes have been very positive so far. This is good news for Torpoint as it will mean staff and patients going to and from the health centre will have peace of mind in knowing that there will be regular bus services to ensure they arrive on time for work and for their appointments. TELEGRAPH 5 NOV 2014: FirstGroup insists turnaround 'on track' as revenues slide 10.9pc Embattled transport company FirstGroup has told investors its turnaround plan is "on track" as it posted a 10.9pc fall in revenues. The bus and rail giant on Wednesday reported first half revenues of £2.9bn, 10.9pc lower than in the same period a year agoTim O'Toole, chief executive, said trading during the first half was "in line with our expectations for the Group and our transformation programmes continue to make progress as planned". ENSIGN VINTAGE FLEET: October update There was a time when we used to get to the Autumn breathe a sigh of relief and start pulling vehicles off for the winter as it quietened down. Not so now, as the season and particularly wedding season work is still very busy with some Saturdays seeing us having up to 13 vintage buses out per day. GREAT YARMOUTH BUS PAGE: 33126 enters service! Surely First could refresh the interior of the Torpoint Tridents with Leather seating like they have done to the P&R fleet! Refurbishing programme is in place for the whole fleet apparently. I'll believe that when I see it based on past record and how slow its taking in Somerset.Does it include all the new deadbeat buses they've brought in for their new Truro services. What vehicles have they acquired for the new Truro services ? It's only an increase of 4 PVR. 1 narrow 05 Solo from Bridgwater and 2 DDA MPDs from Plymouth. Aside from those they have enough but have a load of T reg Olympians which is presumably what is referred to above. Those are just speculative additions from within First for extra Truro College contracts and to replace any dead or nearly dead local Olympians. Also in is a 59 plate narrow short Solo.